Tread carefully as you arrive in this scenic and picturesque paradise because all is not as tranquil as it seems. The dangerous beauty’s home is under siege from fearsome enemies, and now she must put her training to use to protect what is rightfully hers. Will you join her quest for truth and justice? With many different ways to land rewards, this online casino game is a fun and exciting gameplay experience. Play Dangerous Beauty today at your favourite online slots casino. As one of the most popular game development companies in the industry, High 5 Games are enjoying their success story. With over 300 hundred slot machine games played in almost fifty countries, it is little wonder that High 5 Games have created some of the most popular and enjoyable games available. As well as being enjoyed by their fans, the developers have also been recognised for their designs by experts in the industry. In 2016, they were awarded North America Best New Game by Electronic Gaming Review, and in 2013, they received an award from ICE Totally Gaming for Best Manufacturer of the Year. The hero of Dangerous Beauty is a strong and powerful woman, who was drawn to sword fighting from a young age. Having perfected the art, the dangerous beauty is determined to protect her home from enemy invasions, joining up with a series of equally mysterious and threatening heroines. Night falls over a beautiful Oriental garden. An arched red bridge passes over a mysterious dark lake lined by lily pads. What adventures are hidden in the darkness? As the game opens we catch a fleeting glimpse of the ‘dangerous beauty’ herself. True to her name, she raises a fearsome pose with a sword raised ready to strike, whilst gazing into the distance with piercing dark eyes. Look out for the mysterious symbols on the reels including an elegant panther, a fearsome leopard, and several majestic yet deadly warriors. Land the ‘Dangerous Beauty’ wild symbol and watch in wonder as it substitutes all other symbols on the reels. The exciting free games round can be sparked by landing matching ‘free spins’ symbols in all positions on reels 2, 3 and 4. This exciting online casino game by High 5 Games offers an interesting story world whilst maintaining the typical fruit machine gameplay that is timeless in design and available right here at Easy Slot. 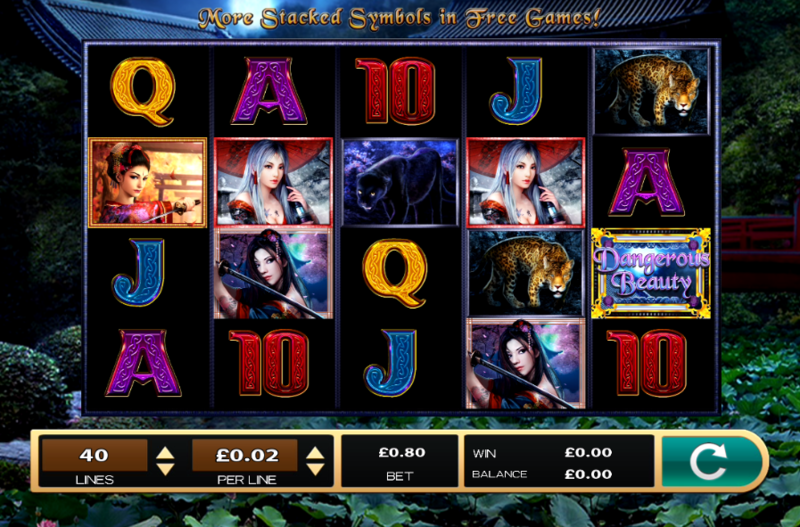 This online slot machine game by High 5 games combines traditional fruit machine features with an engaging Oriental story world, filled with mystery and intrigue. What’s impressive about this game is the attention to detail and stunning artwork that help to create an ominous ambience in the midst of a tranquil backdrop. There are many ways to achieve favourable awards in this slot game, and presents an enjoyable experience for both new and seasoned players. Check out more slots here at Easy Slots.